Grand Island Public Schools Foundation : News & Events : Volunteers Needed for Memorial Stadium Project! Volunteers Needed for Memorial Stadium Project! One of the key points which stand out in my mind after reading all the historical data on the 1945-1947 campaign to build Grand Island’s Memorial Stadium, was the absolute enthusiasm and true grit the entire community had. Men, women and students participated in the volunteer fundraising efforts to secure a facility that would provide a legacy for generations to come. Their efforts were grand and vast! They went after all sizes of gifts, from nearly every Grand Island citizen. Some of the gifts were sizable for those days, but many others were what generous community members thought they could spare in post-World War II days. It is our turn to leave a lasting legacy for our community. 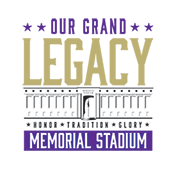 Help us emulate the volunteerism of the past and join us at one of two Memorial Stadium Campaign Volunteer Trainings on either October 15 or October 22 at 5:30pm. For more information and/or RSVP you can contact Leigh Lillibridge at: leigh@gimemorialstadium.org or call (308) 385-5900 Ext. 1246. Do you have a memory of Memorial Stadium? We would love to hear how this stadium has affected your life. Share your stories here!